You are at:Home»Herbs»Piper cubeba Linn. Latin name : Piper cubeba Linn. Description : The fruit is analgesic, antiemetic, antiflatulent, antiinflammatory, antiseptic, aphrodisiac, carminative, demulscent, deobstruent, digestive, diuretic, emmenagogue, expectorant and mildly stimulant. 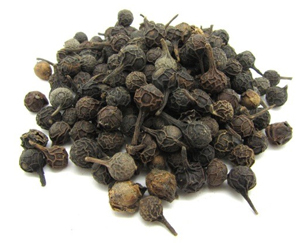 Used as a stimulant to the mucous membrane in diseases of the genitourinary organs such as gonorrhoea, gleet, leucorrhoea and other vaginal discharges of women. As an expectorant it is beneficial in chronic bronchitis and laryngitis. It is also beneficial in thrush, halitosis and fevers. The paste of the fruit is used externally on male and female genital organs to intensify the sexual pleasure during coitus. Recommended Dosage : 1 to 3 g powder of dried fruit. Contraindication : This herb is not recommended during pregnancy or lactation. Avoid in people hypersensitive to piperine. Large doses (many times the recommended dosage) are said to produce headache and dizziness, probably from the augmented cerebral circulation.